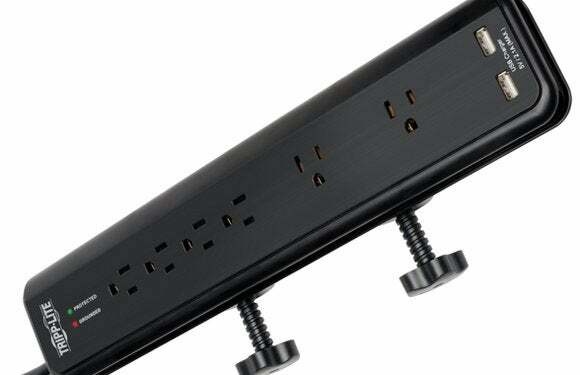 I don’t usually review surge protectors, in part because I don’t have the facilities to evaluate how capable they are of protecting connected devices from dangerous power surges. But I decided to take a look at this Tripp-Lite model because of its great feature set. The Tripp-Lite TLP606DMUSB's most compelling feature is a robust clamp that allows you to attach the outlet strip to the edge of your desk. The clamp needs a surface that’s at least 0.4 inches thick to secure itself to, and the edge of that surface would ideally be at least 2.0 inches deep (the top of the clamp is a little more than three inches wide).The clamp can accommodate a surface as thick as 1.6 inches. The Tripp-Lite TLP606DMUSB is outfitted with a hefty clamp to secure it to the edge of your desktop. Once you tighten the strip’s two heavy-duty knurled knobs to grip the edge of your desktop or table, it won't come loose no matter how hard you pull on it. Thick rubber pads on each of the clamps protect whatever surface it's attached to. Because of the way the clamp functions, the strip's outlets are oriented at a 90-degree angle to your work surface. This limits where you can mount the strip. I mounted it on the chair side of my desk, because I’m constantly plugging and unplugging devices while I test products. But having a bunch of ugly wall warts and electrical cords dangling from the edge of my desk isn’t the most attractive sight. I would have preferred to mount the strip face up on the opposite side of my desk, where I could hide all that clutter behind my monitor. But if I did that, I’d have to reach across my desk to plug things into the outlets, which would be difficult to see because they’d facing away from me. The USB ports are handy for charging your phone or MP3 player without having to plug in a power adapter. The outlets themselves are oriented two different ways to reduce the chance that a connected wall wart will block more than one. 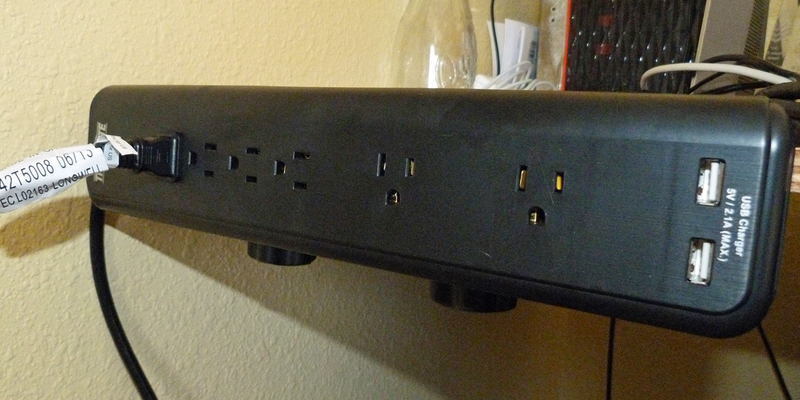 Four of the outlets are rotated 90 degrees, so that their ground sockets are positioned to the left of their line and neutral slots (these are oriented horizontally). On the two remaining outlets, the ground socket is beneath the line and neutral sockets (these are vertically oriented), and they’re spaced far enough apart so that two power adapters can be plugged in side by side. Six outlets should be sufficient for most users, but Tripp-Lite also provides two power-only USB ports. These eliminate the need for outlet-hogging power adapters—you just plug one end of your USB cable into the USB port and the other directly into your device. The USB charger puts out maximum current of 2.1 amps. The strip has a toggle switch on the end of its left side, where’s its unlikely to be accidentally tripped, and there are LED indicators for powered-on and grounded status. The cable for the strip itself is six feet long. It is equipped with a 15-amp circuit breaker and is rated to suppress surges up to 2100 joules. It does not offer surge suppression for ethernet or coaxial connections. The Tripp-Lite TLP606DMUSB's innovative clamp, thoughtful design, and dual USB charging ports renders it a reasonable value at a street price of around $26. 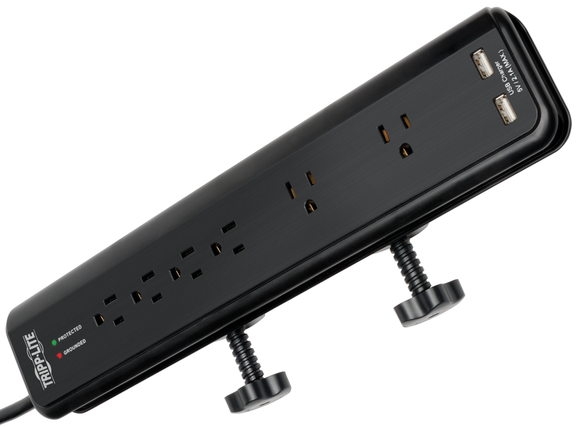 Mount this surge suppressor to the edge of your desk and you'll never need to get on your hands and knees to plug or unplug a device.